I’m pretty sure if you asked anyone under the age of 13 whether they’d rather give or receive during the holidays, they’d tell you that getting a present is much better than giving one, but I’m here to let you know they’re wrong and explain why you should be just as excited to give this year as you are to receive. 1.) Giving will make the people you care about really happy. Obviously, giving will make the people you care about happy. And isn’t that what the holidays (and life in general) are about? When someone is really important to you, you want to see them in a good mood. Giving them a gift specifically catered to them with a nice note about how much you care is guaranteed to do just that. Sure, getting new things for yourself is nice, but I promise that seeing the smile on someone else’s face when they open something you got them is nicer. 2.) Picking out gifts is really fun. Gift giving doesn’t need to be stressful. In fact, sitting down with a list of all your favorite people and brainstorming what would make them smile this holiday season can be really fun. You can get really sentimental and think of something that will remind them of your relationship, or practical and give them something they’ll use every day. It’s great to think about the things your friends would probably love to have but hasn’t managed to get themselves yet. 3.) Giving doesn’t have to be expensive. I know there’s someone reading this thinking, “I’d love to give gifts, but I can’t afford it,” but I promise that it doesn’t have to be. Get really creative and think of DIY projects that you can make for your friends, or consider cooking or baking them one of their favorite foods. Even re-gifting can be meaningful if it’s done right – giving someone you love your personal copy of your favorite book, or a T-shirt of yours that they’ve always loved can be even more special than buying them something from a store. 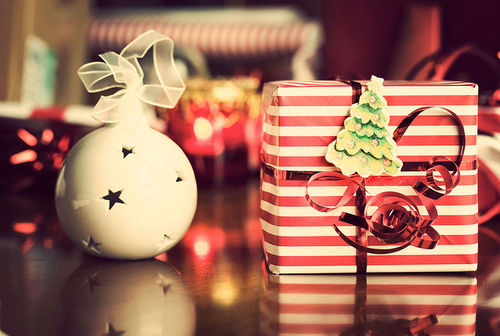 You can also mitigate the cost of buying gifts for everyone you know by setting up a secret Santa so that each friend or family member is only in charge of buying a gift for one other person, plus then you can make a game out of the gift-opening. Plus, at the end of the day, no matter what you give or how much it costs, if you’ve put thought and love into it, your friends and family will really appreciate it. 4.) Generosity feels good and can make the world a little bit better. You don’t just have to give gifts to people you know. Consider donating items or time to charity of your choice, whether it’s Toys for Tots or a local soup kitchen – this could even be a double-gift, if you choose an organization that’s really important to someone you love. Doing things for other people will always feel good, especially around the holiday season. Overall, the holidays are all about spreading love and cheer, and there is really no better way to do that than to give. The joy you’ll get from giving a gift and getting a good response is amazing, and if we all try giving a little bit more instead of worrying about what we’ll get, we’ll all be better off this holiday season.